The essential role of gap junctional intercellular communication in the normal functioning of cells and its relationship to disease is only beginning to be understood. Gap junction channels assemble when connexins oligomerize into a connexon or hemichannel and dock with a connexon from a neighboring cell. These channels cluster at defined cell-cell contacts to form gap junctions. It is now apparent that most human cells express more than one of the 21 members of the connexin family. Therefore, in addition to homomeric, homotypic and homocellular gap junctions, a diverse arrangement of heteromeric, heterotypic and heterocellular gap junctions exist between contacting cells. The complexity of channel constituents and arrangements within tissues is thought to be critical in selective passage of small biological molecules, like secondary messengers, from one cell to another. Interestingly, the generation of connexin null mice has revealed a number of defects ranging from embryonic lethal to relatively normal animals. These findings highlight the importance of connexins in nearly every major organ in the body. In the last couple of decades, mutations in the genes encoding several members of the connexin (Cx) family of gap junction proteins have been linked to a number of human diseases including a wide array of skin diseases and developmental disorders, all of which are currently under investigation in the Laird laboratory. 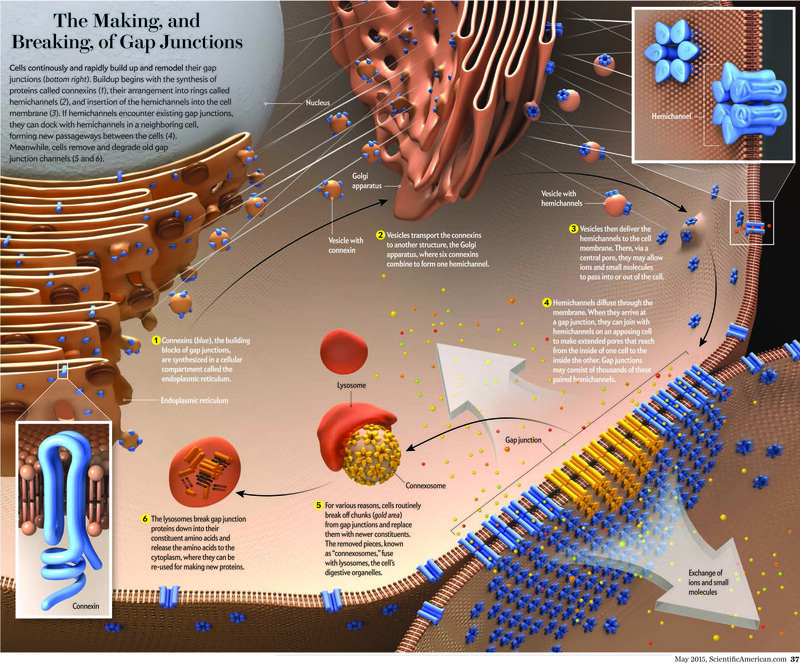 Upon their discovery, pannexins (Panxs) gained instant attention from the gap junction community as they were shown to share sequence homology to the invertebrate gap junction proteins innexins. 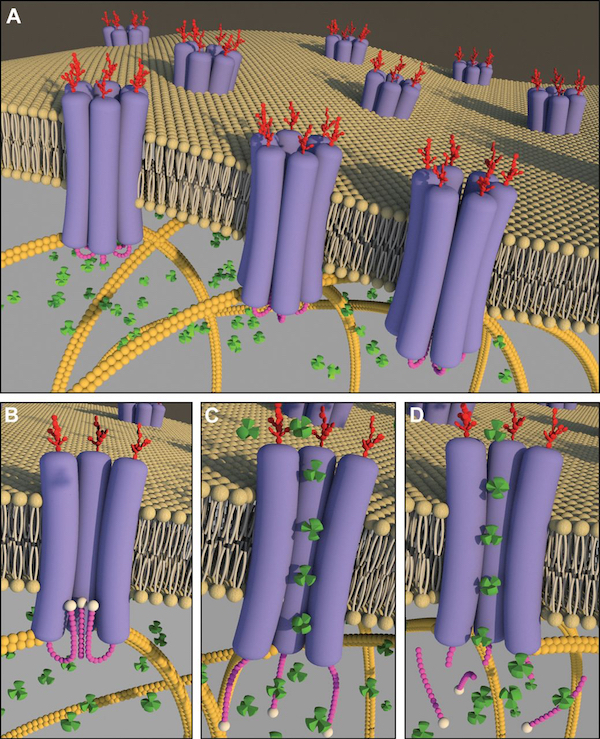 While the proposed role of pannexins as molecular constituents of intercellular channels remains controversial, there is general agreement that Panx1 forms large single membrane channels at the cell surface that serve a role in paracrine signaling. For example, Panx1 and Panx3-mediated ATP release plays a role in the propagation of calcium waves possibly through an interaction with purinergic receptors. ATP and UTP released via Panx1 channels also act as "find-me" signals for apoptotic cell clearance, regulate vascular tone and mucociliary lung clearance. Signaling through Panx1 channels can also be detrimental and contribute to cell death and seizures under ischemic or epileptic conditions, lead to inflammatory bowel disease and promote melanoma disease progression. Panx3 has been reported to play a role in the proliferation/differentiation of keratinocytes, chondrocytes and osteoblasts. In recent years our laboratory cloned all three mouse pannexins, developed an arsenal of well-characterized and reliable site-specific antibodies and established an array of pannexin expression constructs. Through the use of this molecular toolkit we discovered that members of the pannexin family are long-lived, channel-forming glycoproteins that function at the cell surface in ATP release. Other studies highlighted the regulatory role of Panx1 and Panx3 in keratinocyte differentiation and maintenance of the epidermis while Panx3 was found to be important in osteoprogenitor cells, chondrocytes and osteoblasts. Therefore to fully understand the role of pannexin channels in skin and cartilage we will continue our biochemical and cell biological studies on pannexin function and employ genetically modified mice to dissect the unique and overlapping roles of Panx1 and Panx3 in vivo.